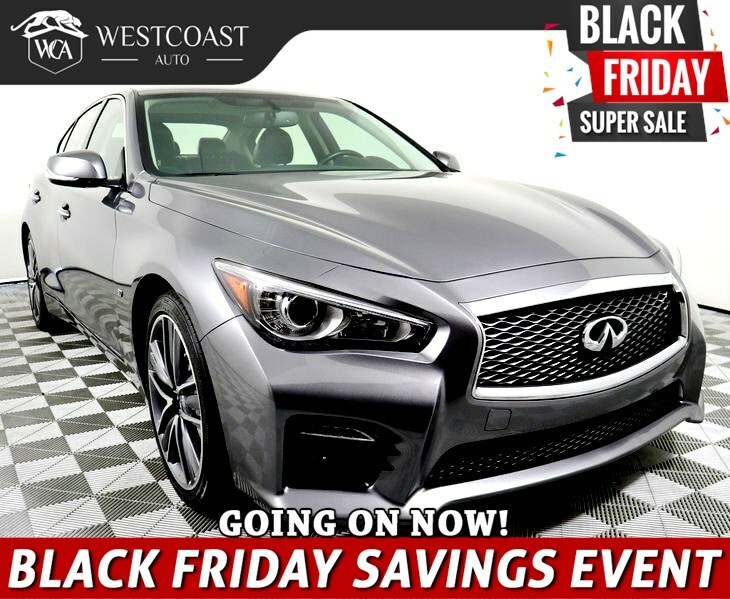 Offering top-shelf amenities and performance to match, our One Owner, Clean CarFax 2015 INFINITI Q50 S is elegant in Graphite Shadow over Grey interior. Our modern luxury sports sedan is motivated by a 3.7 Liter V6 which produces 328hp and is tethered to a paddle-shifted 7 Speed Automatic. This stellar combination allows our Rear Wheel Drive sedan to sprint from 0-60mph in less than 6 seconds and results in near 28mpg on the open highways. The sleek design of the Q50 S features sculpted body panels, broad shoulders, and an aggressive stance. The innovation carries through to the elegant interior that has been intuitively designed with a sunroof, heated leather seats and a fully customizable digital environment that saves audio, climate and navigation settings for each intelligent key. You'll love INFINITI's InTouch system that features dual display screens and the Bluetooth hands-free phone system with a hands-free text messaging assistant. Crank up the high definition Bose surround-sound system with satellite radio and enjoy turning heads in this spectacular machine.